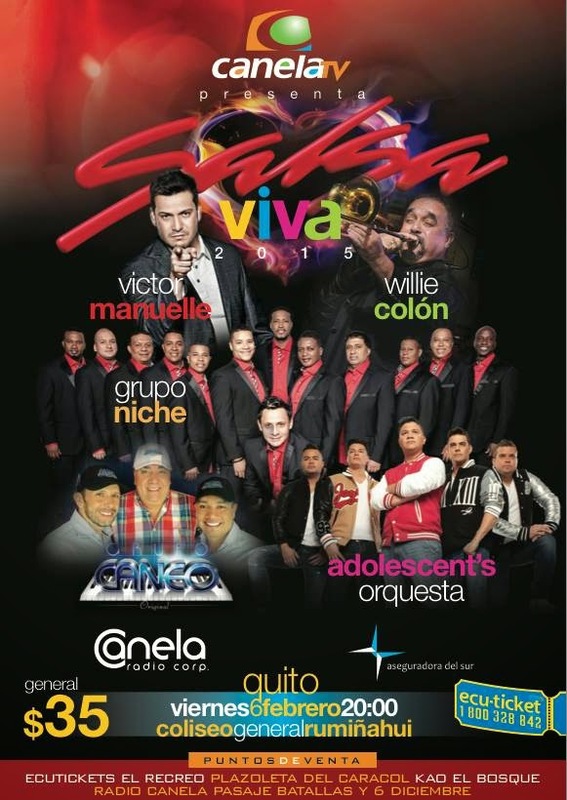 I started seeing advertisements about this amazing concert titled "Salsa Viva" since December of last year and it kept being hyped up on TV and radio as the day of the concert drew near. When I heard Grupo Niche (Colombia), Los Adolesentes (Venezuela) and Willie Colon (Puerto Rico) were in the line up I was super excited and kept watching out for the tickets to go on sale because I wasn't about to miss out on it. The tickets were available for purchase toward the end of January and the concert was slated for February 6th which was yesterday. I was super excited to have the tickets in hand and couldn't wait to attend the concert. The concert was at Coliseo Rumiñahui and when we were buying tickets for the general seats the lady selling the tickets had told us that the Coliseo is small enough so we shouldn't be too far from the main action on stage. She also mentioned that there would be big screens around showing the musicians clearly from all angles. Well, I should have known not to trust her especially when she was stumbling over her words and said that she had actually never been to the Coliseo. Not only were there no big screens to be seen anywhere but the venue was actually pretty darn big and from our seats we really couldn't make out the musicians! granted we bought the cheapest tickets available but dang! Ooh! you want to know how far we were from the action? look at the picture below. You see the area with blue lighting? that was the main stage, clearly even 20/20 vision wouldn't help you here. Good thing we were there more for the actual music than the visuals........although that would have been an added bonus. The concert started at 8 pm and the venue was jam packed with people, you should have seen the line of people waiting outside to get in. To make matters worse it started raining which didn't help at all, I swear the times I decide not to carry my umbrella is when it usually decides to rain heavily. When we finally got inside and located our seating the first band was already playing but I had never heard off them before, they were pretty good. Thanks to the zoom in my camera I was able to at least capture the performers, not perfectly though. From these pictures I don't know if you get an idea of how packed the place was but there was a really good turn out at the concert and as the night progressed more people were coming in. Los Adolescentes were 3rd on the line up and they did not disappoint, they performed one of my favorites Porque Dios te hizo tan bella (because God made you so beautiful) and I was in heaven, I love that song. Their performance had people on their feet dancing and singing along, they sure got everyone hyped up. I was hoping they would perform another favorite of mine En aquel lugar ( In that place) but unfortunately they didn't. Willie Colon was up next and the crowd went wild when he got on stage. His entrance was quite dramatic actually, all the performers came on stage walking but this dude was actually driven to the stage! the crowd went wild as he grabbed the microphone and started singing his first song of the night which was Talento de Television, I love that song! I was on my feet so fast when I first heard the beats that my boyfriend looked at me in shock and just started laughing. The last act of the night was Grupo Niche and as soon as they were announced the cheers from the crowd was deafening, everyone went wild as most people got up and started clapping. Their performance was amazing and I couldn't believe I was finally listening to them live, granted the group members have changed over the years but the quality of performance doesn't betray that. It's still top notch. That's it folks, it was a great concert and I really enjoyed listening to some of my favorite salsa songs being performed live, it just felt so surreal and I couldn't contain the excitement I was feeling. What can I say? me encanta salsa con todo mi corazon. I really miss the music scene in Cali, Colombia and listening to Grupo Niche just made me want to take a bus to Cali just so I can go to the salsa clubs over there. Some of the songs also brought on so many memories of my stay in Cali, some good and some not so good but at the end I can say for sure I will never forget my stay in Cali. Listening to Willie Colon sing made me really want to check out Puerto Rico. Is it crazy that music would make me want to visit a particular country? heck, that's how I ended up visiting Portugal several years ago. One of my favorite musicians, Lura lives there and I loved her songs so much that it inspired a desire to visit Portugal and Cape Verde. Unfortunately I never made it to Cape Verde although I came close to it when I attended a friend's wedding in Senegal but time wasn't on my side. Call me crazy but to each their own, right? At the concert as I was looking around at all the people that turned up I couldn't help but think of how much money the concert must have generated. I am curious to know how much the musicians actually got paid. My boyfriend doesn't understand how I love salsa so much and he always jokes that he thought he was dating an African girl but my taste in music makes him wonder. I don't think someone's nationality dictates what kind of music they should appreciate. He is not that big a fan of salsa unfortunately, he prefers Bachata and Merengue. I guess a girl can't have it all can she?